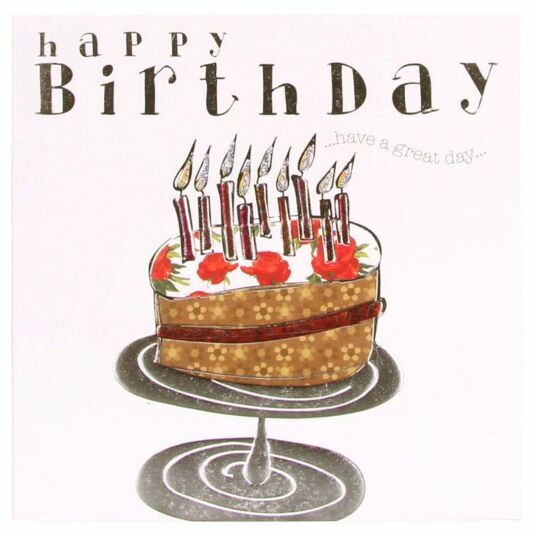 Send a special birthday greeting with this foil embellished and embossed card by Wendy Jones Blackett. The image features a birthday cake with nine glitter topped candles, on a cake which has icing decorated with vintage roses. The cake itself has a brown floral pattern with a shiny ridge of patterned ‘jam’ halfway down. It sits on an embossed silver foil cake stand. The card is blank inside for your personal message. It is printed on environmentally friendly FSC board. Award-winning greetings card publisher Wendy Jones-Blackett creates designs that are unique and instantly recognisable. Hand-drawn lettering in a distinctive style, combined with coloured foil techniques on heavily textured paper results in appealing and eye-catching designs. Each card is made from pulp sourced from sustainable and renewable forests. Made in Britain, the handcrafted cards may not be suitable for children due to small pieces. Supplied with a plain white envelope.